Our last Sunday family dinner all together. Pictured is Cami, Frida, me, Julie, and Shannon (Frances was the one who took the photo). 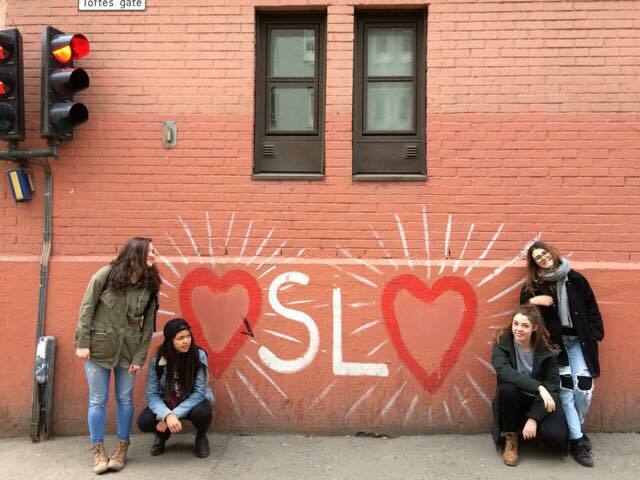 Shannon, me, Cami, and Frances outside one of my favorite places to go on Sunday’s; a jazz bar called Blå. Obviously, I am the only American which has been an eye-opening experience for me to live with people so vastly different than me, while simultaneously learning just how well we can mesh together as one unit despite those differences. 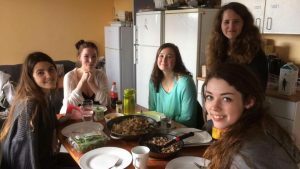 I firmly believe, through my own experience, that one of the best advantages to directly enrolling for an exchange semester is getting to live with people who are not American. 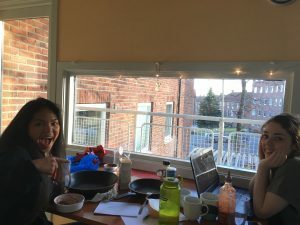 Furthermore, there is so much my roommates have done for me and vice versa, I wouldn’t even begin to describe how grateful I am for them in one blog post, or even one full length conversation. However, I am writing this today (with Shannon and Frances sitting beside me watching the sun set over the buildings of Sogn) because things are about to change after so many months. Frances is about to leave on Wednesday back for Canada; a least a month earlier than the average international student. (I still have two whole months left—the same amount of time I spent in Iceland last summer to put things in perspective). 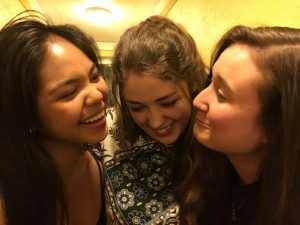 Thus, I am dedicating this blog to my last few days with Shannon and Frances and our friendship that grew one silly night when Shannon drunkenly offered to make us food, starting a friendship I could have never imagined would flourish in the way that it did. One of the first pictures we took together in our apartment. It all began towards the beginning of the semester. Cami definitely was the roommate I was closest with at the start. We traveled to Kraków together and had the same mutual friends. When she left for 10 days to go traveling, it was slightly tough for me. She was my only girlfriend in Oslo at the time because the rest of my friends are all guys; guys that I love, but it was nice to not always be the only girl and to have someone to have meaningful, engaged conversations with when I came home. Then one night Shannon had a lot of her friends over to make and enjoy sangria. Me and Frances were soberly enjoying talking to them as they got louder and funnier the more they drank. It began almost as a bonding moment for Frances and I, just before Shannon came over. She put her arms around us, and I can literally picture her face and voice as she said in her roaring Irish accent, “I am going to make you guys food sometime!” Those words were all we needed. Over dinner just a few days later our real friendship began. Because I can’t even put to words everything that has happened in the period between the start and end, I am going to fast forward to few days before Frances left. So bear with me, it will most likely be a little long because there is so much to say. But here’s to my last few days with such an amazing person, and to the life long memories that took place. 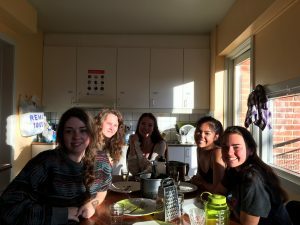 All throughout the semester, we had always thrown parties at our apartment so we decided to dedicate Friday night’s gathering to Frances and her departure from Norge on April 26th. It was a really fun night, spent with good friends and mostly with each other. Frances, very much in character, came home from a friend’s place and went to bed without even telling anyone that she had arrived. Luckily, she felt bad doing that at a party dedicated to her and she eventually came out to enjoy a fun evening. We even had a record timing for getting everyone to leave which was nice because it is always Shannon and I who stay up until everyone is gone. 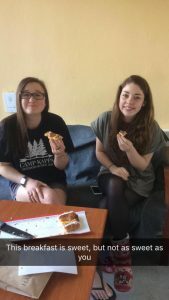 Shannon had to eat, and I started washing the mound of glasses while she enjoyed her meal at 3:30 in the morning—it was deemed a successful night that celebrated Frances’ exchange semester. Frances, Shannon, and me that Friday evening in our yellow hallway. That morning, we somehow were all up and ready around the same time for once—usually it takes several hours to finally gather in the kitchen for tea and chatting. Frances, the early-bird that she is, had already gone out and bought Shannon and I a lovely pastry with a note reading, “This breakfast is sweet, but not as sweet as you”. We sat there drinking tea, enjoying both the treat and each other’s company. Frances decided that because my lucky number is 14 and Shannon’s is 6, that in 10 years (the number in the middle of the two) we must all come back to Norway together. We loved the notion and all set reminders on our phones for April 22, 2027. Shannon and I enjoying the treat Frances bought us – she definitely shows her love by giving and sharing food to those she cares about. Soon after we decided that, about 6 other people came and we all had brunch in our kitchen. It took a while to cook and prepare everything, but it was the most proper brunch I’ve ever prepared with a group of people outside my family. Everyone didn’t leave until around 4pm in the afternoon from brunch and then the three of us went for a walk to Sognsvann, the lake that is about a 15-minute walk from our apartment complex. It was a beautifully sunny day, with crisp air that required a warm sweater but not anything heavier. The lake was gorgeous–it was the first time I had finally seen the water completely unfrozen. While sitting on a rock next to the simmering waters, an idea came to us from out of nowhere. It was no one person’s idea, but it was certainly more of their idea than mine; I was just enthusiastically encouraging the notion. In the period of about an hour, we had an appointment booked for Monday and everything was set to go. By some miracle, we all easily agreed on the same tattoo—something I never thought would happen or would want to happen. After that, we proceeded to spend the rest of the night sitting together, journaling and talking, remembering the amazing times we have had together and our first impressions of each other at the beginning. It’s funny, Frances told me that she didn’t think we’d get along at first because I talked about the environment too much (lols). 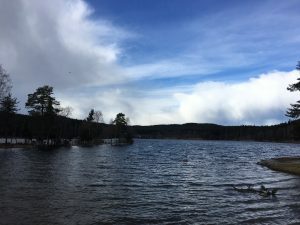 Our view of Sognsvann – keep in mind this is just a 15 minute walk away from my apartment (Oslo is just fantastic!). Frances and Shannon sitting at our kitchen table. We had completely destroyed the kitchen that day, which was highly out of character because typically we are quite clean. Now it is Sunday, the day before we got our permanent “good-bad decision” as it was soon to be denoted. We woke up super early and took part in Oslo’s “Be a tourist in your own city day” which meant all the museums were free to the public. We went to 7 different museums all over the city over the course of the day. It was such a fun, tiring day, and if you ever want to check out an extremely strange artist, hit up Robert Gober and you won’t be disappointed. 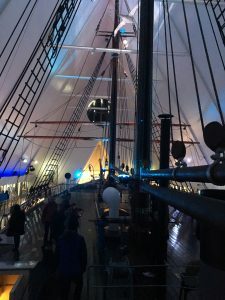 Also, if you are ever in Oslo, you gotta check out the Fram museum. It is so unique and you get to explore a massive ship that is modeled after one that traveled to the North Pole for scientific expeditions. That night we had family dinner. It was the first time all 6 of us had dinner together. Frances, Shannon, and I cooked and the other girls cleaned up afterwards. It kept feeling more and more surreal that Frances was soon to leave us…. This is the boat you can explore inside the Fram museum. It was all about the scientific explorations done in the North Pole and how the ship got stuck in Ice, extending the trip longer than expected. 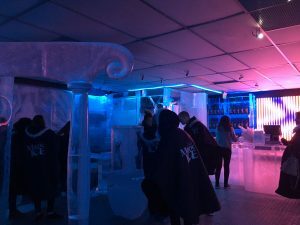 We also got into the Ice bar for free! We didn’t stay long, but it was fairly cool just to get to see a bar completely made of ice and various sculptures. Finally, Monday came. I awoke to Olso’s first snow storm in a while. Of course, after having warm weather for so long, the one day the three of us planned to spend the day outside hiking and exploring it had to be snowing. It wasn’t even regular snow though. It was the stereotypical spring snow—ya know, the extremely wet kind that soaks you just as much as if it had been raining. It figures I showed up late to meet the other two because, well, I had to get coffee before I departed the Blindern campus. They told me when I finally arrived that they wouldn’t have been surprised if I had backed out without saying anything (which I would not have done, FYI!). We set off walking to find the tattoo parlor. Get this, it is called “Old Bastards Tattoo Oslo”—very fitting for a couple of 21-year old women, am I right? Not surprisingly we couldn’t find the place and Frances entered a near-by shop to ask for help. The place was a religious pilgrimage office, run by a cute elderly woman who was kind enough to help us find where to look. Shannon told the woman that only Frances wanted a tattoo (don’t ask me why), and the woman replied with “You’re crazy”! We couldn’t stop laughing as we left the store to keep looking for the shop. Once outside again, I noticed the place was just around the corner and we all laughed once again at how stupid we were to have not noticed it sooner. Upon entering, the tattoo shop was just one big open room that was decorated tastefully—the opposite of uninviting. There was only one man working named Thomas. He had already printed out our designs on separate pieces of paper and I was taken aback with how fast Shannon sat down and began to have something so permanent placed on her arm. Frances was to go second, and I last because this was my first tattoo ever and I was timid. Nervously, I started eating the celery and carrots I had packed as a snack. Thomas laughed at me because they had told him this would be my first tattoo and here I was, shaking and eating vegetables just before him. I still hadn’t decided on a placement and it was beginning to dawn on me what I was about to do. Moment before I got mine done, I decided on a spot only to have Thomas tell me that it was one of the most painful places to get a tattoo. That scared me at first, but then I remained calm knowing I am good at handling pain because of all the times I have accidently gotten injured. As I sat in the chair, I suddenly got nervous because all at once this decision became real. All I can say is it wasn’t bad at all, even tickled at times. We paid and left, and I remained in shock, unable to grasp what just happened. While walking back, I can’t even tell you what we talked about because I don’t think I could comprehend anything in the moment. 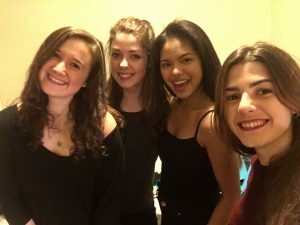 But I do remember Frances saying how we were Charlies Angels because there are not only three of us, but also two white girls and one Asian. So, that’s us; Charlies Angels with matching tats. (Although it is important to note both Shannon and I have not seen the movie, so we don’t quite understand the reference). We spent the rest of the day together in our lovely kitchen drinking tea, watching a movie (Wild Child because Frances hadn’t seen it), chatting about our futures to the tune of The Lumineers, and watching the snow fall from our porch. It was a melancholy day, and we could all feel it, but it was still beautifully peaceful. Frances still amazes me sometimes at how well she understands certain aspects of me and she demonstrated that once again during our conversations about where we saw ourselves ending up. I said how I thought I could end up in a small town of only a few thousand people, where I could farm, ride my bike everywhere, and hike in any direction. She pointed out she couldn’t see me living in a small town for too long because I am a person who is constantly growing and feeding off the environment and people around me. Eventually I would need something “more”, whatever that meant for me. Damn girlie, way to hit the nail on the head before I even could. We also spent a lot of time together in silence—something that Frances has pointed out not only on that day but previously to me as well. To be silent with someone (or two people, in this case) and not feel uncomfortable, but rather the opposite, is something rarely found in interactions. It is special that we can naturally be silent together, as Frances noted before Shannon made a joke how us talking broke the silence. Our plan is to not tell anyone about our tattoo decision unless they notice it for themselves. In fact, I am really only writing this blog for myself to remember these events someday way in the future, not necessarily to declare to the world what we did. To be one-hundred percent honest, we are freaking crazy—I recognize that. But somehow it fits our personalities with each other in a unique way. Most people would never have done what we did for fear of others judging them, or in case the friendship fell through sometime in the future. I believe us three, however, are extremely strong minded individuals who must not care what others think—and this is symbolic of that. I think all of us wanted to do something a little crazy, and so we just did it, without much forethought or contemplation. The fact that we have matching tattoos does not signify that our friendship is the best one we have or will ever have in our entire lives. Instead, it hints at our special semester spent together here—both here in this apartment (Sogn Building 46, floor 3—forever in my memory), and here in beautiful Norway as exchange students. Shannon is the most carefree about tattoos and this kind of stuff, so she seemed very calm the entire time and was just excited to do it for her own reasons. Frances, on the other hand, could be thought of as rather up-tight when you first meet her. However, I think that description falls through once you get to know her. I have noticed that she has become more relaxed this semester, perhaps the most relaxed she has ever been. Thus, to me it makes sense that she did something so “crazy” without any regret. For me, just as the hot dogs were symbolic of me not knowing who I am anymore, this tattoo is a more permanent representation of that same feeling. I would never in a million years have thought I would ever do something like this—it isn’t (maybe now I should say, wasn’t) me. Nevertheless, unlike how upset I was at the beginning of the semester when I felt like I had lost myself, I am now rather at peace with the fact that I have no idea who I am in many ways. It is kind of beautiful, actually. As Frances pointed out, I am constantly changing and growing, and I love that about myself. It is rather exciting to not even know what I am about to do, or how I might surprise myself next. As Frances said, even if the tattoo means nothing to us in the future, it did mean something in the moment, and that’s what counts. We finished off the day with journaling together in silence, and a short venture into the snow where I tried to get both of them to catch snowflakes in their mouths (I failed because Frances wouldn’t do it). But in regards to journaling, it was only Frances and I who were journaling and well, Shannon…. Well, she was on Facebook when she should have been working on her take home exam! Very typical of her, in the funniest way. All in all, it was an extremely average, yet special day that I hope I will never forget. If I start to, I guess I will not only read this, but just glance down at my arm for a quick reminder. Frances, given that see was leaving, had a lot to do on Tuesday and thus was not around for much of the day. I had my math class and then just did some errands because my friend Hope was coming in from Ireland to visit me for the next few days. The last supper featuring my friend Hope who was visiting. 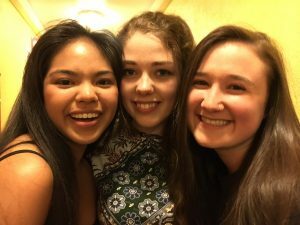 It is extremely difficult making such good friends when you are abroad and then just leaving, never knowing if you will ever see them again. It happened to me when I went to Iceland, and I know its going to be even worse this time around when I leave Norway because I’ve been here three times longer. For Frances, she tried really hard at times to keep a distance to make leaving easier. For example, she would always try to stop herself from calling Oslo her home, because in her words, “It isn’t home” and she just can’t think like that. But I could tell, despite her best efforts, it had become home to her just as it has become my home as well. Goodbyes are never easy, but that doesn’t mean you should try to diminish your experience with those around you in the moment to make it simpler to leave…. My friend Hope and I joined Frances and Shannon for a quick trip into the sentrum to get falafel (even though we had just ate heaps of pasta). Only Shannon and Frances got more food, but I wanted to go to just be with them still and that way Hope would get to see some of the city on her first day in Oslo. 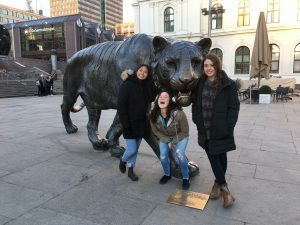 We purposely took Hope to see the famous tiger statue in the sentrum and she took the typical tourist photo of Frances, Shannon and I in front of it for us. I can’t stress enough the strange dichotomy that April 26th was for me. Having Hope with me was amazing, no doubt, and I had one of the top 5 best days of my semester that Wednesday (Ekebergparken is my favorite place in all of Oslo now). However, such an amazing day was juxtaposed to my roommate and friend leaving the country. I was grateful Hope was visiting me, but it didn’t allow me to process what had occurred. I had just said goodbye to someone I honestly might not see again (although that better not the case). 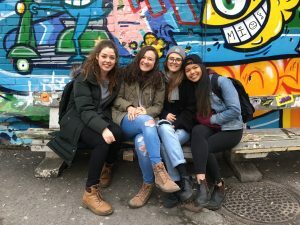 Overall, after this long and extensive blog post that was rather personal, my main message is just about how difficult saying goodbye is when you are on exchange. You can’t really understand the feeling until you experience it yourself, I think. Even though I still have about two months, being forced to say goodbye to those around me is akin to parting with my life here in Oslo up until now. Although I am still here, my experience has now evolved with Frances gone and will continue to evolve and feel different with each friend who leaves. It’s tough and honestly, I haven’t fully processed the events of this past week. But at the end of the day, I would never have done it differently. I am glad I got close to those around me here, even if that makes the end that much harder. Here’s to my lovely friend and roommate, Frances. May she have safe travels back to Canada and a strong final year in university.